What picture appears before our eyes when we think of the rose? Certainly first and foremost that of the hybrid tea rose, distinguished and elegantly slim with its multi-petalled bloom, which hides its innermost secrets from the observer. The colour of the petals, their shape, the way they grow: there appear to be an impossibly large number of varieties of rose, in fact there are about 20 000 of them! In this deluge it is all too easy to forget their far older original sisters the dog roses, the petals of which are simple and which open their hearts wide to us and are rich in perfume and rose hips. The strength for their petals is drawn from the deep root which is firmly embedded in the ground. The hybrid tea rose has lost this vitality and is therefore always grafted to the rootstock of a dog rose. Its golden age as a healing plant came with the pharmacist’s rose (Rosa gallica) in the 13th century in Provins near Paris, where it arrived from Damascus. For almost 600 years Provins was the centre of medicinal rose cultivation, so that in the 16th century, the main street was a large concentration of chemist’s shops and pharmacies. 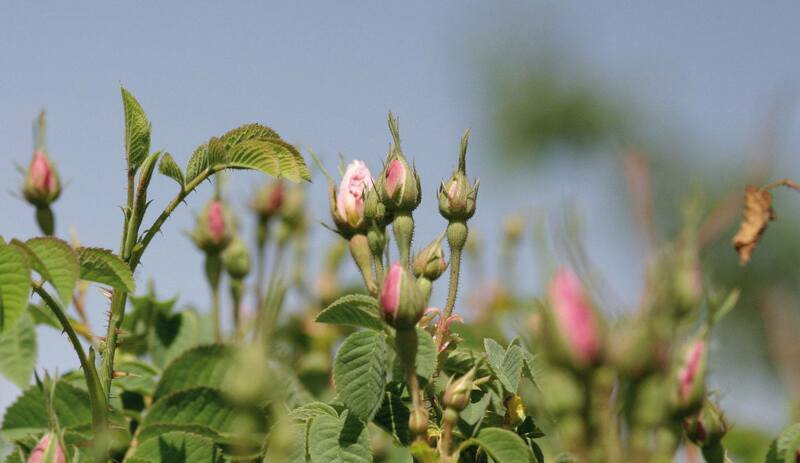 Medicines made from roses were sent from there throughout the world. On account of its harmonising power, the rose can be found as essential rose oil, rose water, rose wax or rose petal extract in almost all the Dr. Hauschka Skin Care range, including the decorative cosmetics. In preparations such as Rose Day Cream, Rose Day Cream light, Firming Mask, Rose Nurturing Body Cream, Rose Nurturing Body Oil, Rose Nurturing Body Wash and Deodorant floral it is paramount, in all others it reigns in secret.